This new 9 day walking tour was especially designed foe people who do like to hike, but for who our regular 20 km per day is just a bit too much. On this tour the length of the walks is between 12 and 15 km per day, which gives you more time to take long breaks, or relax and rest during or after the walk. We also use only three hotels in this tour, so that you don’t have to move between hotels every day, but there’s still enough variety. It is a bit of a combination between a centred tour and a normal tour. 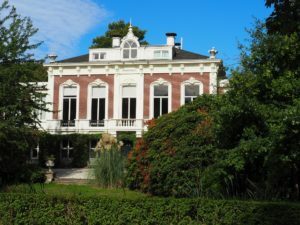 We’ve based this tour on the many estates that we find in the province of South-Holland. They’re there historically since the government of the Netherlands has always been based in the region, and it was one of the richer regions of the country. The estates very in size and in design. Some of them have park-like meticulously designed gardens with neatly placed ponds, while others are sometimes almost undistinguishable from a “wild” forest. And some of the are big enough to almost walk a whole day in, while others can be visited in a few minutes. There is common ground since most of them have a wonderful mansion in the estate, and there’s a lot of rhododendrons. You can find more information here.